In these days I’m making some tests with Ethernet Mainboard, a Gadgeteer compatibile mainboard that is produced by the Mountaineer Group. 8 MB external Flash, for data logging etc. Moreover, the USB drivers must be installed, so that your PC can recognize the board and allows you to deploy and debug applications. Note that there is an update to .NET Micro Framework 4.2 QFE2, but no support for the Gadgeteer libraries just yet. 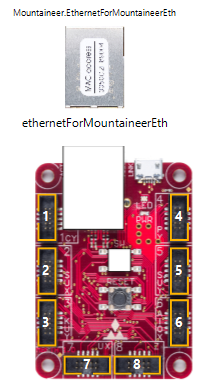 In this first post about Mountaineer Ethernet Mainboard, I’ll show a simple example of a Web Service that allows to remotely control the on-board LED. In particular, we will define methods to turn the LED on, off or to make it blink. So, let’s start creating a new Gadgeteer application, using the.NETMF 4.2 template. We can see that the mainboard is automatically added to the Designer. Then, insert an EthernetForMountaineerEth module from the Toolbox. As the board already includes an Ethernet port, there is no need of connecting it. Adding this built-in module on the Designer simply tells Visual Studio that the mainboard must be initialized to support it. The resulting device schema is shown in the following screenshot. Now we can open the Program.cs file and write the code to configure the system. We define a Timer object that will be used to control the flashing of the LED and a variable that tells if the LED is currently on or off. In the ProgramStarted method, we register on the NetworkUp event, that is raised when the connection is available. Then, we call the UseStaticIP method, in which we specify the IP address to be assigned to the device, the subnet mask and the gateway address. After that, we instantiate the Timer object, using a 500 ms interval, and we define an handler for its Tick event. if it is blink, we simply start the timer. After this check, we call the Mainboard.SetDebugLED method, that allows to control the status of on-board LED, passing the isLedOn variable to it. Finally, we send a response to notify the client that the request has been completed. Note that this example is very similar to the ones that have been previously shown on this blog. It is possible because the Mountaineer Ethernet Mainboard is fully Gadgeteer compatible, so the programming model is the same, as well as the Core Gadgeteer libraries. This allows us to share our knowledge, no matter what mainboard we use. 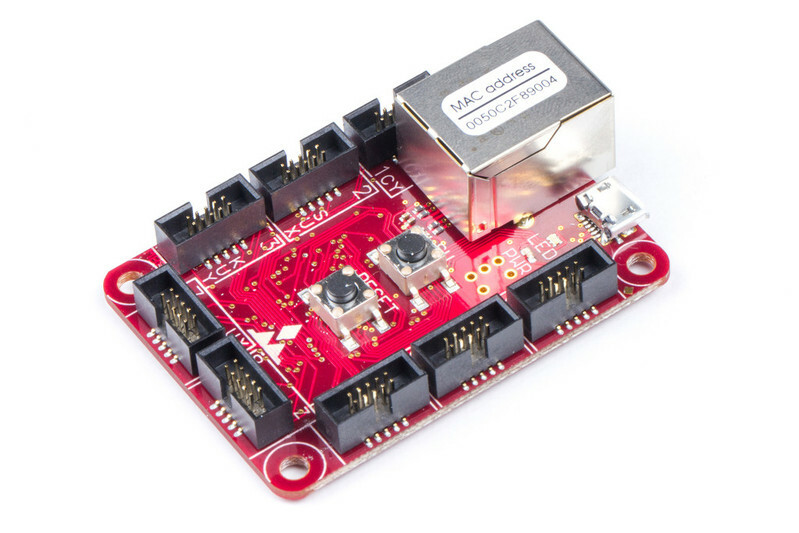 But this means also that we can connect to the Ethernet Mainboard any Gadgeteer module that is supported by its sockets, even if it hasn’t been explicitly realized for it. The Gadgeteer application is available for download. This entry was posted on October 1, 2012, 12:42 PM and is filed under Embedded Microcontrollers, REST Web Services. You can follow any responses to this entry through RSS 2.0. You can leave a response, or trackback from your own site.